Jesus Film Digital Strategies, Cru | Campus Crusade for Christ, Executive Producer of #FallingPlates, Director of FallingPlates.com strategy, Providing leadership, technology and strategy to offer follow-up pathways to anyone in any language. Every other summer, the staff of Campus Crusade for Christ, of which Student Venture is a part, gathers in Ft. Collins, Colorado to be refreshed spiritually, have our vision renewed, and celebrate what God has done. Soaking up the God-centered teaching (You can watch some of the videos yourself at http://bit.ly/CCCStaffConfSpeakerVideos ) has revitalized our souls in the middle of this crazy season for our family. 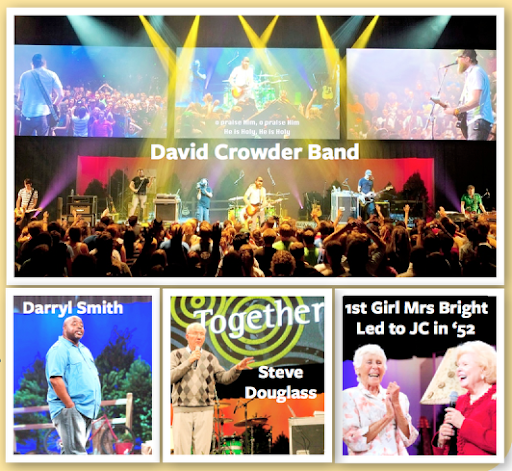 This is a big year for our ministry. 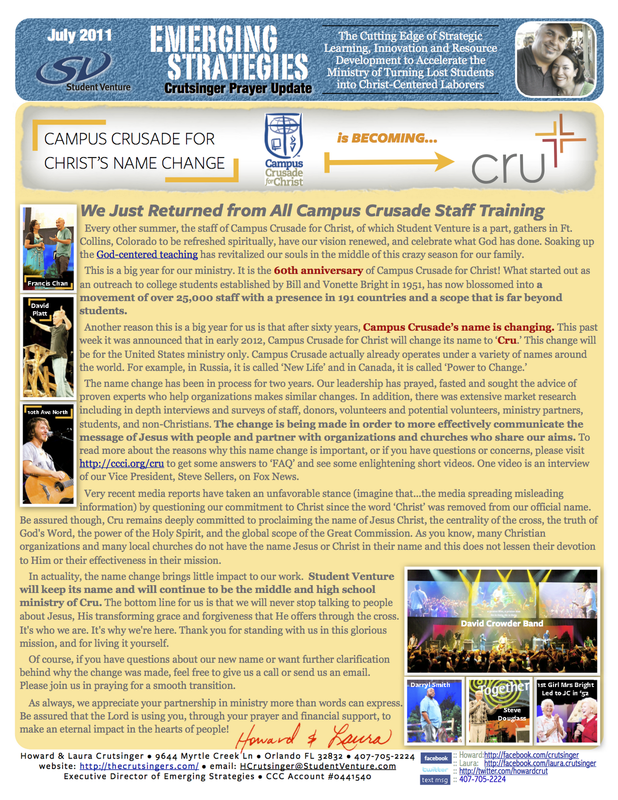 It is the 60th anniversary of Campus Crusade for Christ! What started out as an outreach to college students established by Bill and Vonette Bright in 1951, has now blossomed into a movement of over 25,000 staff with a presence in 191 countries and a scope that is far beyond students. The name change has been in process for two years. Our leadership has prayed, fasted and sought the advice of proven experts who help organizations makes similar changes. In addition, there was extensive market research including in depth interviews and surveys of staff, donors, volunteers and potential volunteers, ministry partners, students, and non-Christians. The change is being made in order to more effectively communicate the message of Jesus with people and partner with organizations and churches who share our aims. To read more about the reasons why this name change is important, or if you have questions or concerns, please visit http://bit.ly/WhyCCCBecameCRU to get some answers to ‘FAQ’ and see some enlightening short videos. One video is an interview of our Vice President, Steve Sellers, on Fox News. Very recent media reports have taken an unfavorable stance (imagine that...the media spreading misleading information) by questioning our commitment to Christ since the word ‘Christ’ was removed from our official name. Be assured though, Cru remains deeply committed to proclaiming the name of Jesus Christ, the centrality of the cross, the truth of God's Word, the power of the Holy Spirit, and the global scope of the Great Commission. As you know, many Christian organizations and many local churches do not have the name Jesus or Christ in their name and this does not lessen their devotion to Him or their effectiveness in their mission. In actuality, the name change brings little impact to our work. 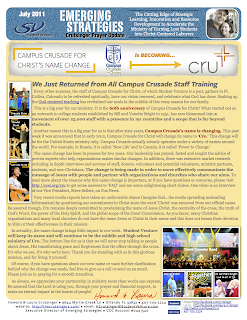 Student Venture will keep its name and will continue to be the middle and high school ministry of Cru. The bottom line for us is that we will never stop talking to people about Jesus, His transforming grace and forgiveness that He offers through the cross. It's who we are. It's why we're here. Thank you for standing with us in this glorious mission, and for living it yourself. Of course, if you have questions about our new name or want further clarification behind why the change was made, feel free to give us a call or send us an email. Please join us in praying for a smooth transition. As always, we appreciate your partnership in ministry more than words can express. Be assured that the Lord is using you, through your prayer and financial support, to make an eternal impact in the hearts of people!